Swanwick on the River Hamble has been home to Moody-Yachts since the middle of the 18th century. These yachts embody 150 years of tradition and innovation. John Moody fell in love with boats when he was a young child. His first effort at boatbuilding began in the courtyard of a house in Swanwick. When John Moody passed away in 1880, he left his business to his son Alexander who continued to build dinghies and fishing boats. It was John's grandson Alexander Herbert (born in 1860) who, together with his son Reginald, started doing maintenance work on boats at the beginning of the 20th century. 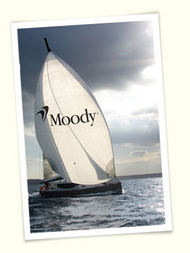 In 1934, Moody finally decided to build yachts themselves. Before laying down the first keel, Alexander Herbert Moody wrote that Moody Yachts were to be of only the highest quality materials and workmanship. To this day, nothing has changed. Since 2007, HanseYachts is setting new standards in the Moody tradition: Standard use of epoxy; innovative production techniques such as the use of a 5-axis milling machine; and their individual cabin system. Moody 45 DS is the premier yacht of the Moody Range. In accordance with this guiding principle, the new generation of Moody’s will be built in a highly developed Yacht production facility with an experienced staff who have the superior skills required and who also have an unreserved and lengthy passion for sailing. 40 years ago Moody was the trendsetter with the conception and creation of the first deck saloon yacht. This legend will be continued with a new design and all of the tradition and passion for the sea. HanseYachts AG, having recently purchased the Moody “Trademark“, is moving forward to capitalize on the 150 years of Moody boat building tradition. Bill Dixon, with more that 20 years of Moody design experience and in collaboration with the superb Hanse design team, has initiated a preliminary design for a new Moody 45 DS Deck Salon world cruiser. The new Moody 45 DS is built, taking into consideration the passion of over 1,200 Moody owners that the Dixon design has pleased and gratified, as a comfortable cruising yacht that is seaworthy and easy to handle. She is designed with a fast hull and a good ballast ratio to make her both stiff and seaworthy whilst a substantial diesel engine gives a good turn of speed under power. The Moody 28 was created along the same design concepts as her extremely successful sister craft - speed, sailing performance, comfort, strength and stability and stylish appearance. She comfortably sleeps six in three separate cabins. There is a private after cabin on the starboard side. Yachting World, 1985, concluded: 'This 28 footer is one of the nicest we have tested. Modern good looks are complemented by the most comfortable interior. The accommodation is comprised of 6/7 berths in two cabins. The table in the saloon folds right away to provide a spacial living area; this also enables the starboard settee berth to convert from a single to a double. Wheel steering was available as an optional extra. Forecabin: 2 single berths. Saloon: 2 bench settee berths. Chart area to port with chart table and stowage. navigator's stool. Galley to starboard. Aft cabin is immediately aft of the galley. Two single berths are fitted in 'V' formation and a double berth conversion. Toilet compartment is to port immediately aft of the navigation area. Marine WC. Oilskin locker. The two main differences between the Mark I and Mark II are the Mark II has a Sugar scoop transom and a forward facing chart table. Wheel steering was available as an optional extra. Forecabin: 2 single berths. Saloon: 2 bench settee berths. Chart area to port with forward facing chart table and stowage. navigator's stool. Galley to starboard. Aft cabin is immediately aft of the galley. Two single berths are fitted in 'V' formation and a double berth conversion. Toilet compartment is to port immediately aft of the navigation area. Marine WC. Oilskin locker. A particularly attractive feature is the huge aft cabin, stretching right across the full width of the boat. Even with its full size double berth there's still plenty of space, and the cabin also has its own hatchway to the cockpit. The forecabin sleeps two, and the saloon settees provide two more berths if needed. And for climbing aboard or swimming, the whole centre section of the transom folds down and forms steps leading to the water. The concept and design of Moody 33 centre cockpit fin keel model was completed by Angus Primrose in 1972 and tooling was completed in November of that year. This was first production yacht developed jointly between A.H. Moody & Son Ltd, Southampton and Marine Projects (Plymouth) Limited. It was an immediate success and models have appeared ever since. Power and Sail magazine, October 1974: 'Planned as a comfortable family cruising yacht of light displacement and with a high performance under sail or power, the Moody 33 shows many of the characteristics to be found in the more trendy production yachts of today. Clean, smooth, sleek and with high freeboard, a carefully calculated layout below decks, a roomy central cockpit with two-berth cabin aft, a simple masthead sloop rig, and the fin keel and skeg rudder profile expected of fast yachts, the Moody 33 has all these and a good deal more besides'. The main difference from original Moody 33 is a different layout in the saloon and the cockpit was not quite as wide thus giving larger side decks. The entrance to the aft cabin was not in the middle but slightly off set.Forecabin: 2 berths convertible to double, toilet compartment to starboard. Pilot berth to port between fore cabin and galley. Saloon: Single berths to port and starboard, galley to port with static navigation. Aft cabin: (access from cockpit) 2 berths, dressing table, wardrobe. Based on the original Moody 33 hull but an aft cockpit version. There is generous, well-planned accommodation for six in three well appointed cabins, two berths in fore cabin. Settee berths on saloon. fully equipped galley, a separate toilet with provision for a shower Starboard cabin: double quarter berth. Good sized aft cockpit. Wheel steering.